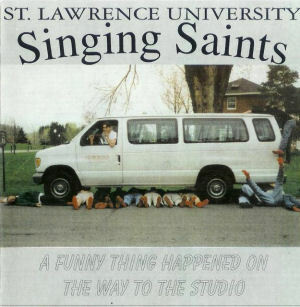 This was the first Saints album to deliberately feature the performances of groups that spanned more than four college years. Because of the difficulties involved with album production (preparing enough music, obtaining funds, scheduling, etc. ), the group decided to purchase a DAT recorder to capture concerts and record each year in the WSLU/North Country Public Radio studio during Senior Week. By doing so they would be able to record enough material from which to cull a respectable album, and insure that every Saint gets the chance to appear on record, even if one wasn’t released while they were at SLU. 1. A Funny Thing Happened. . .